I've become obsessed with this absorption method of cooking. It's so easy now to cook just as much pasta as I want for one dish, without having to boil that big old pot of water. No more reheated leftover pasta, with its bits of soggy here, dry and chewy there. And with this method, the pasta cooks in the same pan with the sauce, so there's much less cleanup. This is rotini cooked in chicken broth with artichoke hearts and just a pinch of fennel, using the basic method I used here. The fennel and the artichoke go well together. I used the ten-inch skillet this time instead of the larger one, so the pasta was more submerged in the liquid so it cooked more evenly and wasn't quite as al dente as the penne was. And then I used up the rest of the artichoke hearts cooking rigatoni in water. That was good, too, with some of The Spice House's Sunny Spain lemon and pepper mix. This is a quick, easy meal when you want something fast. 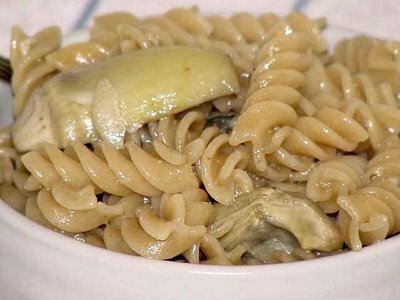 If you're using raw vegetables, you add them when you add the pasta and let them cook with the pasta. If the vegetables don't need to be cooked, just add them at the last five minutes to reheat them.